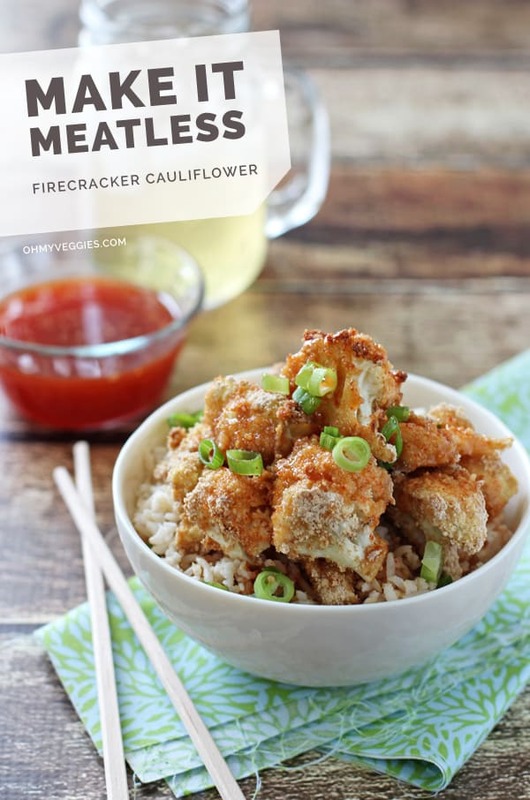 Firecracker Cauliflower - A Vegetarian Recipe from Oh My Veggies! I am a huge fan of recreating take-out type dishes at home. With complete control over the ingredients, you can create something much healthier — and something that just downright tastes better as well. Plus, it can be fun. You can take popular dishes and turn them into meatless meals that you can’t always get on the menu. Like this Firecracker Cauliflower. Traditionally made with chicken or shrimp, this dish is usually pan-fried or deep-fried and then coated in a sweet chili sauce. 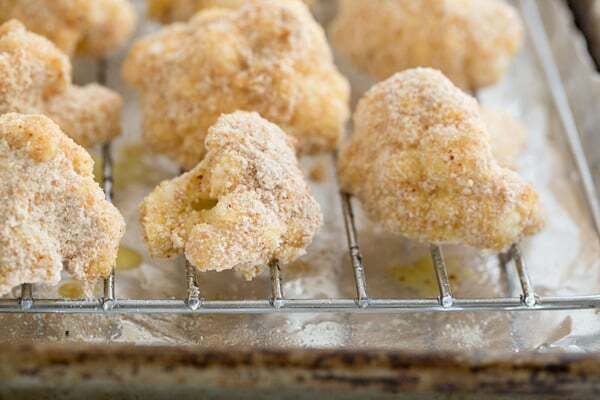 Since I’m not the biggest fan of frying (particularly deep frying — all that oil just scares me! ), I decided to go the baking route instead. Easier, healthier and no bubbling oil, which is a huge bonus in my book. By using a wire cooling rack set onto a baking sheet, you can keep the bottom of whatever you’re baking from getting mushy — just make sure it’s an oven-safe rack! Serve the cauliflower over a bed of rice, sprinkle with some green onions and then drizzle with the finger-licking good sauce. I found that drizzling the sauce instead of coating the cauliflower with it helps keep the florets nice and crispy. And go ahead and keep a small bowl of the sauce on the table for extra dunking. Trust me on that one. This vegetarian spin on firecracker take-out features crunchy baked cauliflower in place of chicken or shrimp. Serve over rice and drizzle with a sweet and spicy homemade chili sauce for a dish that rivals any restaurant. Preheat the oven to 400ºF. Line a rimmed baking sheet with foil and then set an oven-safe metal cooling rack inside the baking sheet. Spray the rack with an oil mister or cooking spray and set aside. Lightly beat the eggs and milk in a small bowl until combined. In a shallow dish, add the flour, breadcrumbs, garlic powder, paprika and salt. Mix to combine. Working with a few pieces at a time, dip the cauliflower into the egg mixture, shake off the excess, then place in the breadcrumb mixture, tossing to coat. Place the cauliflower on the prepared baking sheet in a single layer (you can put them close together). Once all the cauliflower is coated, spray it lightly with oil. Bake for about 20 to 25 minutes, until the coating is crispy and golden brown, and the cauliflower is tender but not mushy. While the cauliflower is baking, make the sauce. In a small bowl, whisk together the honey, sriracha, garlic, vinegar, and salt. Taste and add additional sriracha for more heat, if desired. Divide the rice into bowls and top with with cauliflower. Drizzle the sauce over the cauliflower and garnish with green onions. Serve with additional sauce on the side for dipping. Such an easy and tasty treat! My picky toddler and the while family really loved it! Thanks for sharing! So happy to hear it Jeni! Have a wonderful weekend! There was a cauliflower staring back at me every time I opened the fridge for the last week. It met it’s demise last night which was a delicious success. I substituted the Garlic Powder for Celery Salt which seemed to work nicely and also the sriracha sauce for some Thai Hot Chilli Sauce which I think is basically the same thing. So glad you enjoyed it! And that you used up that cauliflower! Crisp cauliflower outsides smothered in a spicy sweet sauce sounds awesome!! Definitely the kind of thing that I crave when ordering takeout but usually can’t eat because it’s all meat-based. WIN for making it at home, AND healthier, AND all vegged up! haha yes exactly! I always get frustrated when there are no good veggie take-out options on menus! What can I use instead of egg? I am vegan but this looks so good!!! Thanks! Hi Marlin! I think it should still work fine without the egg. My suggestion would be to try using more milk (coconut milk would be my choice!) – about 1/2 cup or so. Dunk into the milk and then press lightly to get the breadcrumb mixture to stick. You could also try using a flax egg but I think it should be good with just more milk. I made this for dinner tonight and it was absolutely delicious!! So happy to hear it Heather! I have to say I stumbled across this website a few months ago and it has totally changed my life. I love being vegetarian, I love cooking and I have loved every recipe I have made from this website! This recipe takes the cake though. It was so delicious in every way! The only thing I did to enhance the flavor was add sesame oil, sesame seeds and some sliced almonds to the rice, makes a world of a difference to have great rice with great veggies!! Thank you so much for this recipe!! I’m so so happy to hear you loved it Amanda! And that rice sounds delicious! Oh my word these were good!! Made this tonight and its terrific! I used panko instead of the whole wheat bread crumbs, and use Thai red curry paste in the sauce and regular vinegar. Delicious! I also ended up pan frying to avoid heating up the house. So happy to hear this Alysa! And those changes sound delicious! This was so amazing!! The flavor of the sauce was amazing and you can’t even tell it is cauliflower. Tastes like such and indulgence! Thank you for your outstanding recipes!! So happy to hear you enjoyed it Nani! Thanks for letting us know! I am loving so many of these recipes but just wondering nutritional info?? ?